As a young child, Garfield Logan lived with his scientist parents in Africa, who were developing "reverse evolution" to bring back extinct creatures. He received a certain amount of abuse from his parents, consequently becoming increasingly reclusive. Garfield contracted a rare illness called Sakutia, which is lethal to every species except the West African green monkey. To save his life, his father used an untested serum to change him into a West African green monkey for 24 hours so that the virus could die out. The serum had the unintended effect of turning his skin, eyes, and hair green and granting him the ability to metamorph into any animal of his choice. His parents later died in a boating accident; to this day, Garfield believes he could have prevented their deaths. After he is rescued from two kidnappers who forced him to use his powers to help them in their crimes, Garfield is left under the care of a court-appointed guardian, the despicable Nicholas Galtry. Galtry realizes that his embezzlement from the Garfield estate will be exposed when Garfield reaches maturity and receives his inheritance, and thus plots to kill Garfield. The villains he hires to kill Garfield are stopped by the Doom Patrol; Elasti-Girl and her husband Steve Dayton expose Galtry's embezzlement and adopt Garfield. Garfield later joins the Doom Patrol. His uniform includes a purple cowl, and he takes the code name Beast Boy. During his tenure with the Doom Patrol, Garfield has a romantic relationship with a girl from his high school named Jillian Jackson. After he saves her from Galtry (then using the alias "Arsenal"), the relationship dissolves. Later, Beast Boy is deeply affected by the deaths of the Doom Patrol. 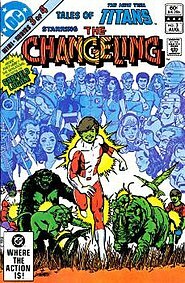 Beast Boy has the ability to morph and transform into any animal that he has seen himself or has seen in an illustration (as is the case when he shapeshifts into an animal such as an extinct dinosaur or a microbe). These transformations took only a second and Beast Boy has demonstrated that he is capable of rapidly changing his form with little or no effort expended. As a corollary to this power, he can transform back into his default form if an external force like magic transforms him into an animal. His power enables him to completely alter his body mass, being able to take the shape of animals far larger and heavier than himself, such as an elephant, a hippopotamus, or a Tyrannosaurus rex (though until recent stories, such larger forms would physically exhaust him), or smaller and lighter animals such as mice, arachnids and insects. 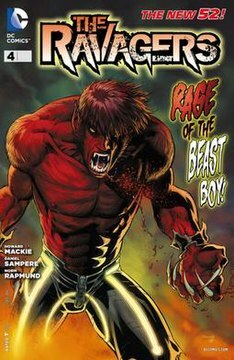 As a result of his rapidly changing genetic structure and mass, Beast Boy has an increased healing factor comparable to that of The Creeper and Deathstroke, allowing him to heal from bullet wounds, burns, and broken bones in a matter of seconds, and in some story lines regrow entire limbs. He cannot change or return to a form if the space he occupies is too small and he cannot normally break the confines (as seen when he attempts to transform into a Tyrannosaurus Rex underneath a bridge and hits his head, instantly aborting the transformation). His power also enables him to radically alter his body structure and take forms of animals without limbs, like snakes, or those without skeletons like a jellyfish. In two notable instances, he has even taken the form of multiple individuals simultaneously (once as a swarm of fireflies, and again as a mass of barnacles). In another comic he was seen to take on the form of what appeared to be a green version of Beast from X-Men. While an animal, he gains all of the physical abilities, attributes, and characteristics of said animal, such as greatly enhanced superhuman strength (a gorilla), superhuman speed (a cheetah), and enhanced durability (a turtle), and abilities such as flight (various birds), and aquatic breathing (various fish). He can even gain the specific poisons and toxins produced by specific snakes. He also gains the ability to survive or otherwise live in the same hostile environments some animals can, as seen in one comic where he morphs into a parasitic worm to become resistant to the stomach acid and immune system of Brother Blood when he dived into the villain's intestinal tract to retrieve Raven's chakra. While in animal form, Beast Boy retains his human intellect, memories, and the ability to speak. No matter what form he takes, his skin, hair, and eyes remain green, making most of his animal forms easy to distinguish from real animals of that species. (In the DC-Marvel crossover with the X-Men, his attempt to infiltrate Darkseid's forces and stop him from recreating Dark Phoenix, was frustrated by the fact that Darkseid's minions are not green.) In the early comics, his coloration would change to that appropriate to the animal form he had taken, with only his head remaining green. In the series Tales of the Teen Titans, it's implied that Garfield also has unexplored psionic abilities. Although Mento's psionic helmet is only capable of amplifying its user's psionic abilities, Garfield was shown to successfully use it to trick the Teen Titans into perceiving him as Slade. At one point, he has displayed an ability to read lips, which he used to discover a assassination plot that Galtry devised against him. Beast Boy appears in Young Justice, voiced by Logan Grove in the first two seasons and Greg Cipes in the third season Young Justice: Outsiders. First appearing in the season one episode "Image", eight-year-old Garfield Logan lived with his mother Marie Logan who runs the Logan Animal Sanctuary at Qurac's Bialyan border. A transfusion of blood from Miss Martian causes Garfield's green-skin and shapeshifting abilities, joining Young Justice in the second season after his mother was murdered between the seasons by Queen Bee, he also has selective shapeshifting as he can change one part of his body like his head or arm to add certain abilities to his fights (he first demonstrated this ability on Rann when partly taking on the form of an alien bird and adding monkey parts to his human form). In the third season Garfield has now become a young celebrity star and is an advocate for protecting the world against meta-human trafficking. It is revealed that he was a member of the Doom Patrol with him and Mento being the team's only survivors, and that he was chosen as the avatar of a monkey god.